Two Lamborghinis, one red Performante and one blue Huracan, parked one behind the other at gas station pumps. On the opposite side of the Lamborghinis, a minivan was pulling away from the gas station. Apparently, the driver of the minivan made a mistake: the fuel pump nozzle was still inside the fuel tank. The result? 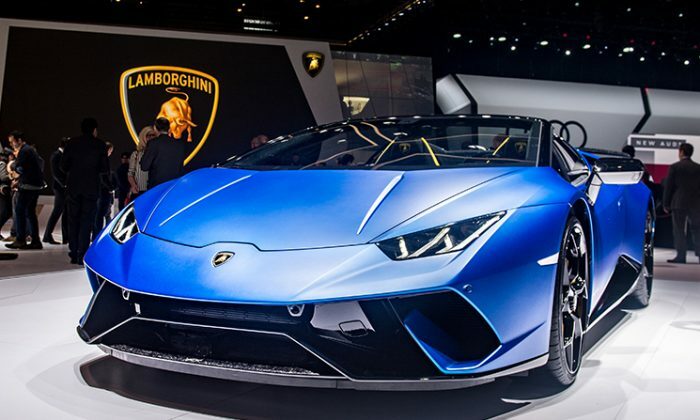 The $400,000 blue Lamborghini was engulfed in flames. “I’ve seen people drive away from pumps and make mistakes, but never seen something to that extent with that much money being destroyed,” customer Thomas George told Fox2Now St. Louis after the July 8 incident in Kirkwood, Missouri. A man named Parker Gelber, who identified himself as the driver of the red Lamborghini Performante, gave details of the episode in a Facebook post with photos and video from a bystander. A baffled Gelber had a bystander come to him with the first aid personnel. The bystander was recording the Lamborghinis to show his friends before the incident. He caught exactly what was happening to the Lamborghinis. According to the bystander, when the minivan was moving out of the station with the fuel pump nozzle inside the gas tank, the pump sprayed fuel directly onto the blue Huracan’s engine bay. “It instantly ignited.” Gelber wrote in the Facebook post. Gelber is a car salesman at Exotic Motors Midwest. He and a friend, driver of the blue Huracan, had been out in the cars. The incident happened when they stopped for gas, the Riverfront Times reported. No one was hurt in the event. Police have ruled this incident to be an accident. Fox2Now St. Louis said.